Up until yesterday my '84 GL-1200 was starting and running like a champ. I could set the choke on a cold engine and hit the starter button and the bike would fire right off almost instantly with just a bump of the button. Yesterday I was going to make a run to the gas station to get gas. I hopped on the bike, set the choke and again as usual the bike fired right up. However this time as I sat on the bike waiting for it to warm up for a moment I noticed the RPM on the tachometer was just loping long at about 500 RPM at full choke. 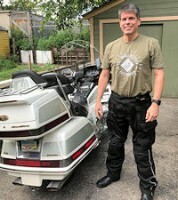 It was a very hot and humid day yesterday with a heat index of probably 100 degrees and 80% humidity so I thought, well maybe since it is so warm the bike does not need any choke. So I backed off on the choke a little bit and instead of the RPM's increasing the RPM's dropped even lower than 500 RPM and nearly killing the engine. And no matter where I placed the the choke setting the engine did the same thing. Finally, in order to keep the bike running I had to manually give it fuel with the throttle. Then after the bike warmed up a bit I tried setting the choke again to see what it would do and found that at full choke the engine would finally run on its own and at about the 1000 RPM mark without my assistance on the throttle. After warming up a little more I could back off on the choke to about 1/2 choke and then the engine would drop down to a consistent 500 RPM. I then took the bike for a ride and found that finally after the bike reached normal operating temperature I could back completely off the choke and the bike would finally idle at stop right at the 1000 RPM mark like it should. I'm wondering.....does this sound like a choke adjustment issue? I'm also wondering what a normal choke experience should look like on a cold engine. At full choke should the engine instantly run right up to about 2000 RPM or so? A while back I pulled cleaned and re-gaped my spark plugs. The manual said the gap should be set anywhere between .031 and .035 inches. I originally had them gaped at .033. In my mind my logic told me that the wider the gap the bigger the spark and better the ignition of the fuel/air mixture; so I set my plug gap at the farthest end of the range at .035. Could it possibly be that by widening the gap on my spark plugs that I may have created a weaker spark that could be causing this choke situation? I appreciate your thoughts and wisdom concerning this. Re: GL-1200 start up issue. When "things just happen" to an otherwise properly running machine, I tend to try to take a step back and try to figure out what is different than the last time the machine was known to run well. In your case, on the surface at least, it would appear that the ambient temperature and humidity are the only factors to which you can attribute the bike running poorly. Warmer air is less dense than cooler air, and contains less oxygen per cubic foot as a result. Having written that, it isn't really a significant difference in density, and if you check the barometer, you can see that the barometric pressure doesn't change all that much based on temperature. Humidity also "tends" to make engines run better because of the increase in performance of running a little water in the intake air provides. All things considered, I'd say it is a wash for the potential effect of a 100 degree say over an 80 degrees day... so, I don't see that as being some significant change. So, you're right back to where you started, trying to figure out what would cause your engine to run poorly from one day to the next. If it were mine, I'd start at the fuel tank and work my way toward the carbs, check air filter to make sure the intake ports are clear and the filter is clean, checking fuel petcock, fuel lines, fuel filter, fuel pump. If they all check out, I'd check the carb synch, and check for vacuum leaks. If you don't find anything fuel related, next thing I'd do is pull the spark plugs and see if there's any difference in color. While the plugs are out, check the resistor screws inside the plug boots to make sure they're tight, check the wires all the way back to the coils to make sure they're in good shape. I'd also pull the battery cover and check grounds and "hot" connections from the battery to the frame and to the coils. Sometimes electrical problems present like fuel/air problems and sometimes we get fooled into thinking fuel problems are electrical in nature, but not too often. If you start at one point and work your way through how fuel/air and spark make the engine run, you'll find the trouble faster than if you jump around from one thing or another trying to sort things out. I am fresh out of ideas. I am wrong as often as I am right concerning what is wrong with someone else' motorcycle without having seen the machine in person. Guessing with limited information, as to the source of the trouble, is sketchy at best. HawkeyeGL1200 wrote: When "things just happen" to an otherwise properly running machine, I tend to try to take a step back and try to figure out what is different than the last time the machine was known to run well. Thanks HawkeyeGL1200 for your fantastic and detailed response. The time invested and quality of your well thought out response makes me even more embarrassed to say that you will never believe what happened. In fact I'm not sure what in fact did happen. 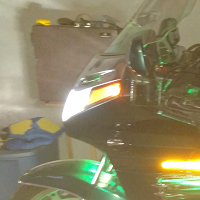 A friend stopped over today and I described to him what had taken place with my Goldwing and he said "Show me what it is doing". We went out to the garage, I set the choke to full choke, turned the key, bumped the start button and the bike immediately fired right off like it normally does.......only this time instead of the tach loping along at only a measly 500 RPM like it did yesterday, the engine immediately ran right on up to 1500 RPM and purred like a kitten during the warm up and then revved to about 2000 RPM as it warmed up a little more. I them backed off on the choke lever and lowered the idle down to 1000 RPM where it ran as smooth as glass. I hopped on the bike and went for a ride and after just a minute or two of riding I had the choke clear off and the engine running like a stallion. I'm still scratching my head wondering what it was I experienced yesterday. My friend told me that if the bike sat for several days in the garage with less than half a tank of fuel in it and near 100 degrees and 80% humidity in the garage; he said he supposed that it might be possible that some condensation may have formed on the inside walls of the fuel tank and somewhat fouled the gas, and that maybe my ride yesterday after I had finally gotten the bike warmed up could have moved this little bit of moisture through the system and was no longer in the system today when I started the bike. I guess it's possible. But maybe one of those things I will never know for sure. I do remember my dad always telling me to never let your fuel tank get below half full. Maybe this is why. I don't know. Again......thanks for your time invested in your response. These are all good reminders of how to proceed through a problem. Thanks again!! Sorry I bothered you all. I am having similar issues, just today my bike wouldn't start (3 different times) at all, sounded as if the kill switch was thrown which I checked each time. I let it sit for 10 minutes and bang fires right off. A friend who is very knowledgeable about bikes (though he prefers his bikes with the letter HD) said he thinks it's the vacuum diaphragm behind the fuel petcock that is going bad. Does anyone have any thoughts on that? Also I need to rebuild my fuel pump, does anyone know where I can get a gasket kit for an '85 Aspencade? thanks for any thoughts on his or my issues. Thanks LDodge. My Wing is running like a champ now. I'm thinking it was just a little was something simple like a little moisture that formed in the fuel system. I guess my friends theory makes sense. I had half a tank of gasoline which by nature is a cool or cold liquid sitting for over a week in a less than half full steel tank. Night time lows have been getting down into the mid 60's at times and then revving up to heat indexes of 100 degrees during the day. So it makes sense to me that water could condensate on the inside of a cool fuel tank on a hot day like water does on the side of your glass of lemonade sitting on the patio. I've since filled up the tank and I'm trying to ride the bike more often in order to keep the bike active and I've had absolutely no problems since. I went for a ride again last evening and the bike started, ran through it's warm up stage and performed beautifully. I'm guessing the electric fuel pump on your '85 Aspencade is probably the exact same pump that is on my '84 Interstate. When I restored my Interstate I found that the fuel pump was bad and I researched the possibility of rebuilding it myself and found that no one offered any kind of rebuild kit for them and found no on line advice at all concerning rebuilding these fuel pumps. I found several places where guys suggested using a similar electric pump from certain automobiles but I didn't like the looks of them. Luckily I was able to find a new, in the box, old stock pump (NOS) on eBay for a very reasonable price. I don't recall there being a vacuum diaphragm on the fuel shut off on the 1200's. Mine is a manual petcock. HawkeyeGL1200 wrote: I don't recall there being a vacuum diaphragm on the fuel shut off on the 1200's. Mine is a manual petcock. Hi WingAdmin and Hawkeye -- Can you think of any other reason why every once in a while my wing won't start, like the kill switch is thrown. Then I wait 10 minutes or so and she starts right up. Yesterday was pretty hot and humid and this happened three times. LDodge wrote: Hi WingAdmin and Hawkeye -- Can you think of any other reason why every once in a while my wing won't start, like the kill switch is thrown. Then I wait 10 minutes or so and she starts right up. Yesterday was pretty hot and humid and this happened three times. It could be a crack in the master (dogbone) fuse. Remove the master fuse and inspect it - if it is failing, it may crumble when you remove it. When it doesn't start, does anything else turn on? Does the headlight turn off when you press the start button, even though it doesn't start? The master fuse is brand new (I just changed it 3 weeks ago). When it doesn't start, everything else works and yes the lights do dim / volts drop when I press the start button. These on again / off again problems are the hardest to figure out, especially from a distance. You could also have a corroded kill switch. Does the issue have anything to do with how full the fuel tank is? When you have trouble starting the engine, does the starter seem to turn the engine over faster than on the days it starts right up? If it does, you probably have a fuel problem. Do you turn the petcock to the off position after riding? Is the starting issue most often related to having the engine off for a time with the fuel petcock turned off? I stopped on the way home from my first ride on my 1200 and picked up a new fuel filter, hose and clamps and changed the filter and lines in the parking lot of a NAPA store. A week or so later, I pulled the remainder of the fuel lines off and replaced them (outlet side of the pump). The filter did not seem to be plugged, but the pump thanked me by becoming noticeably quieter. I never did pull the pump discharge line off to flow test it, because it never quit on me, but it is something you can test to make sure there is fuel getting from the fuel pump to the carbs. I don't like making the fuel delivery system work harder than it needs to in order to get gas to the bowls. I'll think on it while I'm riding to work and see if anything else comes to mind. You might want to pull the plugs before doing anything else and see if they are clean and even colored. At least you will know if gas is getting to all cylinders equally and it will give you a starting point to work from. While they're out, check the resistor screws in the boots for tightness. If the plugs don't look too good, you can change them while they're out as well. You could also have a corroded kill switch. My kill switch has given me issues in the past, squirted it with WD-40 and hasn't given me any problems Does the issue have anything to do with how full the fuel tank is? When you have trouble starting the engine, does the starter seem to turn the engine over faster No difference in speed though one time when it wouldn't start, I let it sit for a while then started it with a full throttle and it roared louder then I have ever heard beforethan on the days it starts right up? If it does, you probably have a fuel problem. Do you turn the petcock to the off position after riding? Never use the petcock, I was told there is a screen behind it -- do you know about this?Is the starting issue most often related to having the engine off for a time with the fuel petcock turned off? I stopped on the way home from my first ride on my 1200 and picked up a new fuel filter, hose and clamps and changed the filter and lines in the parking lot of a NAPA store. A week or so later, I pulled the remainder of the fuel lines off and replaced them (outlet side of the pump). I should really look into finding the time to do so -- if you have a free weekend, you are more than welcome to visit SW Wisconsin The filter did not seem to be plugged, but the pump thanked me by becoming noticeably quieter. I never did pull the pump discharge line off to flow test it, because it never quit on me, but it is something you can test to make sure there is fuel getting from the fuel pump to the carbs. I don't like making the fuel delivery system work harder than it needs to in order to get gas to the bowls. As my signature says, I'm wrong a lot of the time. There's something to be said for being able to listen, see, smell, and touch 'a piece of equipment while trying to figure out what is bothering it. In the instances of "internet troubleguessing" those on this end of things rely heavily on those on the other end (the end where the motorcycle resides) for accurate description(s) and feedback on suggested sources of problems. I'm always hopeful that something I contribute CAN help. Mostly, I just want to provide a sounding board for people who most often work things out on their own, given enough time and with a little help to take the mystery out of how the machine works. HawkeyeGL1200 wrote: There's something to be said for being able to listen, see, smell, and touch 'a piece of equipment while trying to figure out what is bothering it. In the instances of "internet troubleguessing" those on this end of things rely heavily on those on the other end (the end where the motorcycle resides) for accurate description(s) and feedback on suggested sources of problems. I agree. And more than once, I've had where someone who posts a problem, say their brake lights suddenly stopped working. You work through some diagnostics and determine the problem is near the connector at the back. You ask if the connector looks good, and the reply is something along the lines of, "well it's not there anymore, because I installed the whizzbang brake light flasher just before the brake lights stopped working." So now I usually ask "have you made any changes" before starting on diagnostics. My bike had a problem of not starting back up when shut off on a hot day. The problem turned out to be the impulse coils. My bike has been doing the "I don't want to start just right now, give me ten minutes to think about it" routine. This morning she did it again -- started like a champ even though it was 32°F (have a battery tender on her), drove 1/2 hour, parked for an hour, turned her on, drove 10 miles parked for 1 hour and then nothing -- just the starter trying to turn over the engine. Just out of curiosity I flipped the kill switch back and forth a few times and noticed that when I did this fast the rpms (digital dash) would jump between 300 and 500 -- weird. Then out of disgust I turn off the key and pulled it out only to have the radio continue to play. I re-inserted the key, turn it all the way to the right then back to off and pulled it out -- nothing. I am guessing these two anomalies are pointing to the ignition system but electrical is DEFINITELY not my forte. Where should I start? Is it ok to remove the kill switch (never use it, always turn off the bike via the key). I hope someone out there has had a similar ghost in their bike -- this is a bit annoying. I think I would start at the ignition switch, seeing as you're already seeing additional incorrect behavior. As for the tachometer and kill switch, this is to be expected. The tachometer measures engine speed by watching the timing between spark plug pulses. If you temporarily kill or modify those pulses by killing the spark (with the kill switch), the tachometer will see those momentary alterations as invalid timing information and will display incorrectly, for a brief moment.